Update: I got ClockworkMod Recovery working on my phone, that’s a better choice. xRecovery is a custom Android recovery system for all variants of the Sony Ericsson Xperia X10, including Xperia X10 Mini Pro. If you want to take it to the next level by being able to take and restore full backups, flash custom ROMs, manage partitions and wipe not just data but cache and Dalvik cache as well, you have to install it. It’s similar to ClockworkMod Recovery which cannot be installed on SE devices. 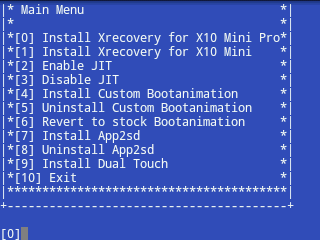 Here the steps I used to install xRecovery on a Xperia X10 Mini Pro. If you need to root the phone you can follow my guide. At the end (3-10 seconds) phone will reboot.